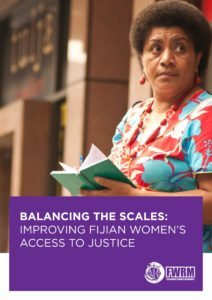 The Fiji Women’s Rights Movement (FWRM) recently launched their research on Balancing the Scales: Improving Fijian Women’s Access to Justice research report. The research was an opportunity for FWRM to evaluate the Family Law Court, twelve years after its commencement in 2005 and to garner a better understanding of the barriers that women continue to experience in accessing the formal justice system. Fiji is considered a pioneer in the Pacific in the area of Family Law reform, with FWRM being instrumental in the drafting of the Family Law Act in 2003. The aim of the research is to further inform law reform in this area and improve women and children’s access to the formal justice system. The research found various systematic barriers that women face for example, while many women initiated family law or domestic violence restraining order applications in the Fiji courts (in 2016), only 1 in 3 had legal representation leaving the majority to navigate the system without proper legal representation. Moreover, the research report found that 9 out of 10 sexual offence cases reported to the Fiji Police Force, women and girls are the victims/ survivors and that men were predominantly perpetrators in 9 out of 10 violence and sexual violence cases in Fiji. The full report is available on the FWRM website here. Pacific Women supports FWRM, through the We Rise Coalition, a collective of four independent non-government organisations, including FWRM, funded by the Australian government. ‘Balancing the Scales – Improving Fijian Women’s Access to Justice’ project is supported by the European Union and UN Women.